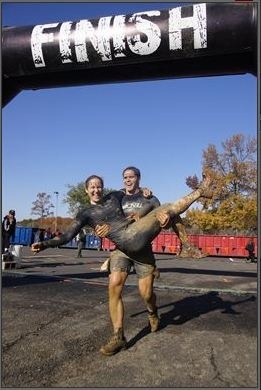 I ran Tough Mudder New Jersey on October 20, 2012 with Mike, my teammate and amazing buddy. 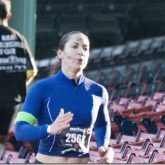 Initially, I planned this TM as a World’s Toughest Mudder qualifier, as I knew that Toronto Tough Mudder will not be my fastest time, running with a team. However, I ended up running the Toronto course twice, and qualifying on my second lap. 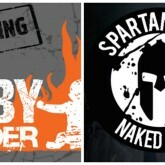 Also, after much consideration, I decided to run Spartan’s Time Trial in Boston, rather than the World’s Toughest Mudder – they are happening on the same weekend. 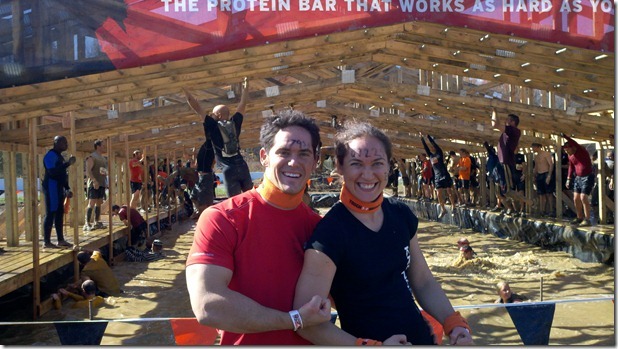 Long story short – Tough Mudder New Jersey was nothing but a fun run with friends!!! It was well after dark, when I finally made it to Syracuse. That’s what happens when I make the drive by myself, and entrust myself to evil Google Maps. Where are your orienteering teammates, fighting over the best route, when you need them (hi, Goss. hi, Captain Craig). I fail to feel bad about the detour, however. The route takes me through the smallish road in rural New Jersey. Trees have changed color to obscene hues of red and yellow. Zero modesty. Zero subtlety. Most of the drive feels like an acid trip. I drop off my car, and Mike and I are off to New Jersey. I do not realize that the race is actually only 45 minutes away from New York City, so the drive is much longer than I expected (noticing a theme here?). It is well after ten when we finally make it. Thankfully, our hosts are awake and live only five miles from the race course. Steph –> Mike’s friend, and our main host. All smiles, and epitome of friendly. Steph’s mom –> the mommiest mom I’ve ever met I think… she took amazing care of us. And food. Oh my god, the food. Steph’s dad –> did not say much, but just made things happen in the background, from grilling steak to starting a fire. Joel –> Mike’s old friend from the Navy. They did have not seen each other for years, and what a great reason for a reunion this was. Joel is a native Texan, and a sweetheart. He entertained us all evening with his stories about “shir diddy” ( = shore duty) and made sure we had enough “birrr” ( = beer). *When I grow up, I want to speak Texan. 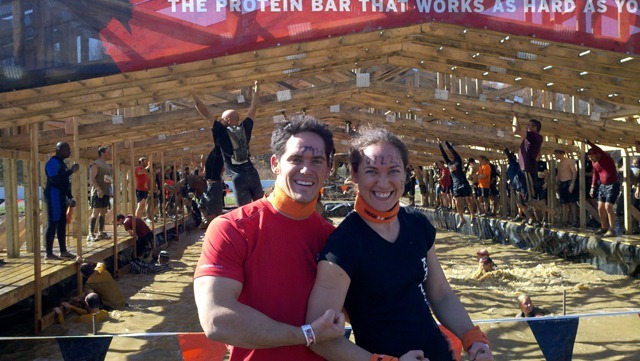 This year, Tough Mudder New Jersey took place in Old Bridge Raceway Park – a prime spot for drag racing and motocross racing. I wake up, completely confused regarding my location. For a second, I am convinced that I am at home. Slowly, the events of last night come to me… 🙂 I am in the land of Yankees. The wimp that I am, I was somewhat worried about the weather this late in October, but Saturday morning exceeded all expectations. It is an absolutely gorgeous weekend. We are spoiled rotten – the coffee maker is just waiting for a push of a button, and Steph’s mom drives us directly to the course site. The initial plan is to run the course twice – once in the earliest wave possible, and then again, with Steph and Joel. Mike and I take off in 8am wave… It’s a long stretch of pavement. The arctic enema is waiting… seven minutes into the race (sorry, not a race, but a challenge). Not fun, but good to get it over with… It takes me at least a mile to catch my breath after the freezing cold water. This is Mike’s first event since the summer, and he is eager. I do my best to slow him down. “Pace… pace!”, I remind him. More pavement. We make it to the muddy mile. A stretch of up and down trenches, filled with water and mud, definitely throws off any comfortable pace we started settling into. 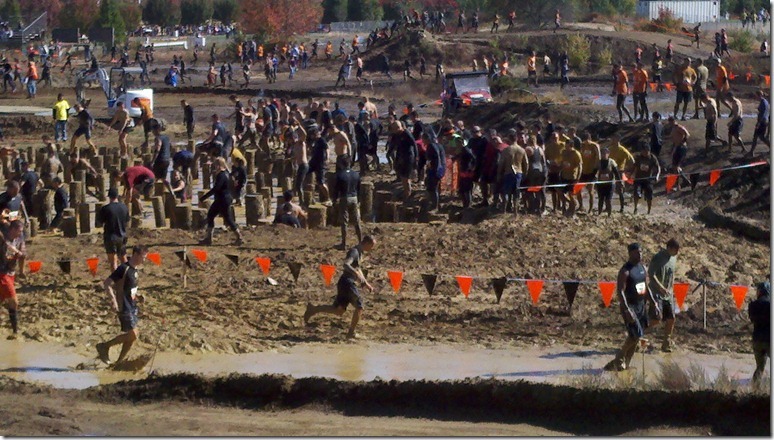 This course is very different from Tough Mudder Toronto, which was set at a ski resort. What did that mean for the Toronto’s event? Hill climbs. More hill climbs. We climbed the same damn (steep) hill at least five times. Here, we jog up and down small hills designed for motocross – I can do this forever. Because the course is set in a park, however, we are somewhat limited in terms of space. The course loops on itself many times over. While we do not encounter any crowds or waiting in the early wave, few hours later, the park starts to resemble the mass evacuations during a zombie apocalypse. I start feeling my knees about half way through the course. That throws me… After all, I did not feel my knees during the Ultra Beast! Why now? The answer becomes pretty apparent during yet another loooong stretch. Pavement. This is the most pavement I’ve encountered all year. Given that I am no longer training for distance, I start questioning the second lap. I’m also getting a little bored with the tight loops… I already feel like a hamster in a wheel… running this course one more time? mind-numbing… I’m having an absolute blast, and decide not to tempt fate and the gods of knee joints by running this twice. Been there, done that. Mike is on board. Funky Monkey is my favorite obstacle. Hands down. This one’s tough. The bars go up, and then down, with a large gap in the middle. As I grab onto the first bar, it’s wet. Argh. Mike’s already on the other side, cheering me on. I’m on the second half, when Gangnam Style starts blasting from the speakers nearby. “Hang on”, Mike yells. “With THIS song?”, I yell back. “You freakin’ bet!” This is the inaugural theme song of the Ultra Beast, and I’ll be damned if I fall off an obstacle when this thing is playing in the background. I make it across. I’m really happy to give Hangin’ Tough (the rings) a go. I couldn’t do them both times at TMT. This time, I get across half way. I definitely have the technique down, so I climb out of the water after the fall, dripping wet, but feeling accomplished. Next time. I get quite a VIP treatment at Electric Eel. Well over half dozen shocks, as I drag myself through. Nice buzz for the next few miles… I should try incorporating this in the morning, instead of coffee. For a precious mile or so, we hit trails, and I instantly feel at home. Phew. This I could do forever. For a nice bonus, I meet Robert – one of my fellow PrecisionNutrition sisters’ husband! 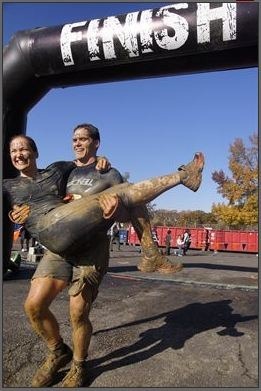 We chat for a bit about the upcoming World’s Toughest Mudder. He is enlisted!!! Smoke Chute. The event’s mystery obstacle. Climb the ladder, face the hole filled with smoke. Let go. This one is a bit of a mind-$*%*@. I land in water a second after letting go. The drop is pretty harsh on my back. But ok.
Pirate’s Booty. This one is BRAND NEW. Swim across cold water, then climb up a cargo net. And over. Loved this one. 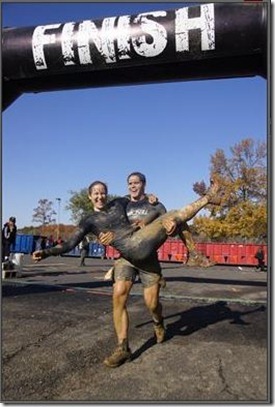 The toughest obstacle? Wounded warrior carry – pair up with someone and carry them. Then switch. I’d say Mike got a better bargain in this one. And I got to piggyback 210 pounds of pure Oklahoma muscle. 50% of Team Trifecta with monkey bars (which we smoked) in the background. Please note the freshly earned orange headbands (along with the two I earned in Toronto!). 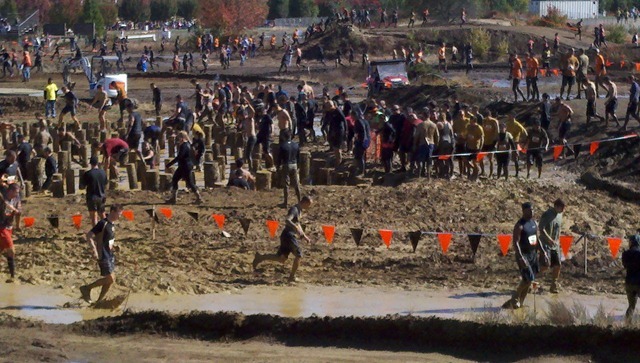 Tough Mudder is a like a big frat party with some running thrown in. Ok, a lot of running. And mud. We see everything from huge teddy bears to 250lb tires to Halloween-esque costumes to… well… very little. This lovely team embodies the party spirit of the event. 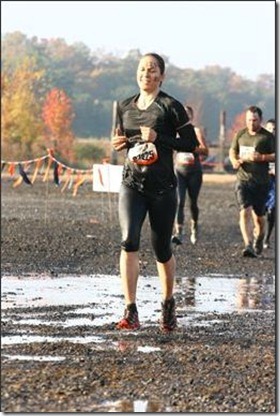 Tough Mudder New Jersey course – check. Slight sunburn at the end of October – check.